Charlie is a thirteen year old skewbald gelding, who is the most experienced member of our team. Charlie can be relied upon to stay calm and obedient in nearly any situation and gives confidence to our more inexperienced donkeys. Besides his therapy work, Charlie has appeared in theatres, parades and even on TV. You might have seen him in the Christmas episode of Casualty last year. Charlie loves his food. He can hear a carrot bag opening from half a mile away and will help himself happily if the feed room door is open. Charlie has brought a lot of joy to a lot of people. He knows he's a superstar and we're not going to disagree! Danny is a donkey with attitude. 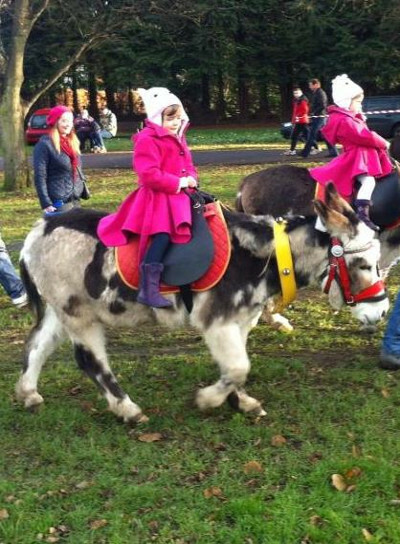 Branded 'Asbo donkey' by our vet, he has bags of character and is a real hit wherever he goes. Danny is happy to give out cuddles and loves a scratch under his neck in return. 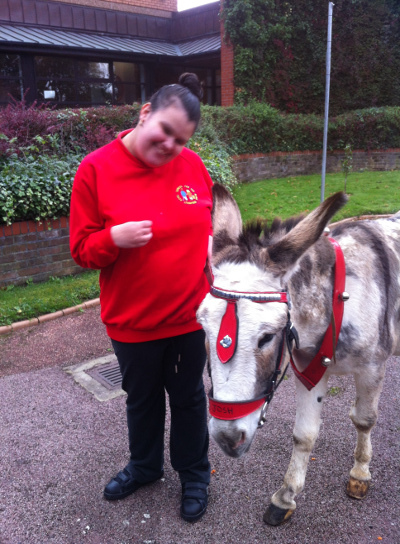 He is very brave and inquisitive; at one event a fire engine backed towards the donkey area with flashing lights. All the other donkeys moved away but Danny marched straight up to it and tried to get on board! At just three years old, Danny is very much the baby of the team and doesn't do any strenuous work, however he thinks he runs the show! Dermot came over from Ireland several years ago and was initially quite nervous. We have done lots of work with him and he has taken confidence from the donkeys around him, turning into a lovely, gentle donkey. In the field, he is good mates with Danny and the pair of them spend hours chasing each other around and trying to rip the others' rug off. At eight years old, he really should know better! Dermot is now confident enough to go into buildings and even people's bedrooms. 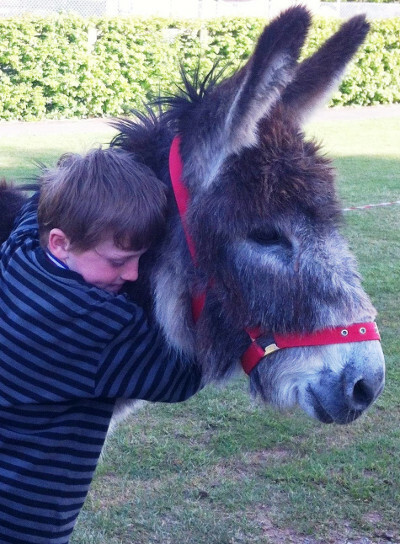 He is a very affectionate donkey who loves a cuddle and will stand all day to be fussed over. Dermot is the first donkey to see us arriving at the yard everyday and will greet you with a very loud eeyore before you've even got to the gate! 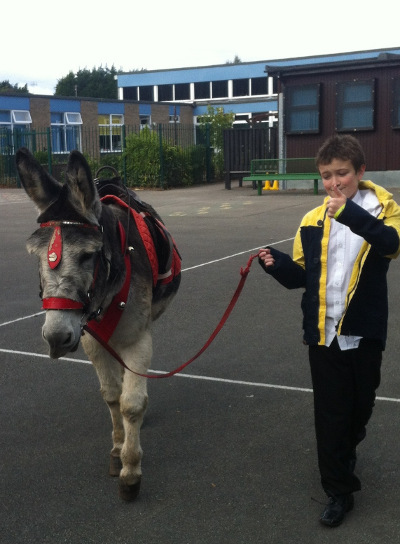 Josh, like Charlie, was initially a rescued donkey. With years of kindness and patience, he is physically and mentally in good shape and loves his work. Josh is happy to work for hours but likes to be part of a pair, rather than working on his own. He is not a nervous donkey but can be stubborn and plant his feet if he's not happy with something! 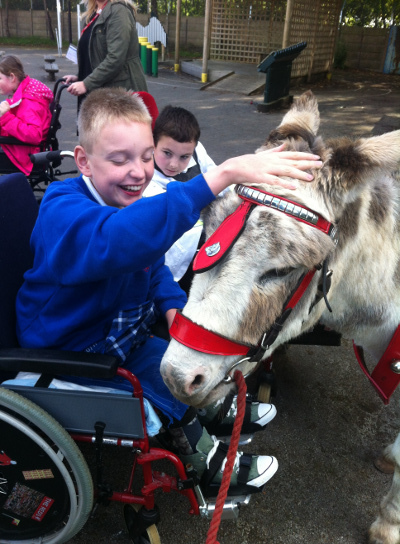 Josh has been into buildings accompanied by another donkey and he is very patient and calm. He is still quite young at eight years old and we hope he will continue to be a valued part of our team for many years to come. 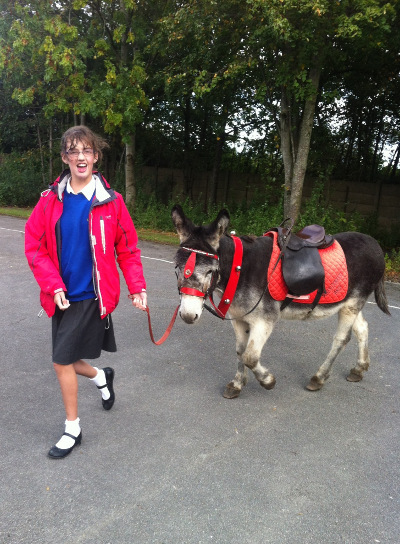 Andy used to be quite naughty when he was younger but, aged eleven, he has matured into a gentle, kind donkey who started doing therapy work last year. Because he is such a good worker, he is often poached by our sister company, Mike's Donkeys, to work on the beach or at fetes and events around the country. We did however manage to borrow him for lots of therapy work last year and he was very good at it, proving happy to walk alongside wheelchairs and standing quietly to be fussed over. 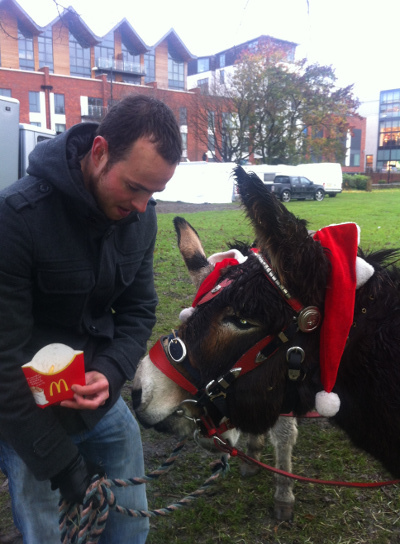 Dennis is our award winning donkey. He is another who splits his time between Danny Donkey & Pals and Mike's Donkeys but he is Mike's pride and joy so we don't get to poach him very often! 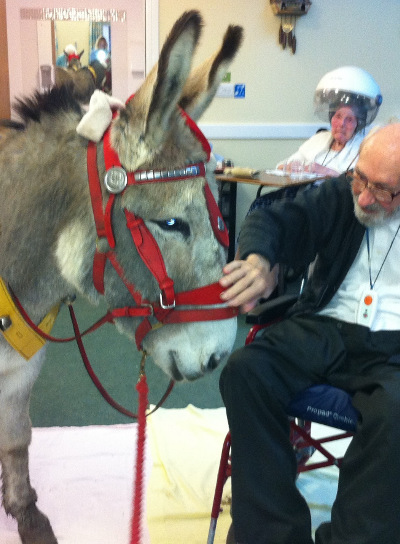 Dennis is the winner of Britain's Best Beach Donkey, a prestigious award based on conformation, manners and condition. The success has gone to his head a little and he likes to rule the roost. The fact that he is clearly Mike's favourite doesn't help! Dennis is normally paired with Andy to work and they are good friends. What he might lack in looks (think short, stumpy and slightly too round) Aubrey makes up for in character. He is exceptionally brave, doesn't mind working on his own and goes into buildings without a second thought. Aubrey likes to keep you on your toes and his party trick is making a dive for the small jockey door on the trailer when it is opened, rather than patiently waiting for the ramp to come down. He loves his cuddles and is well-behaved and hard-working as long as he is kept away from his partner in crime, Basil. Together the pair are double trouble! 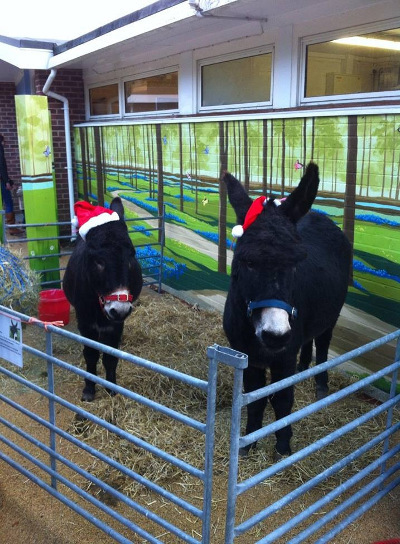 Basil came to us along with Aubrey, having previously done donkey assisted therapy elsewhere. He is not as bolshy as Aubrey and is a lovely gentle donkey. Basil works happily on his own and is happy to take on new situations with confidence. His main love in life is food and is waistline is a testament to this! He is very noisy as soon as he sees any sign of hay and will do anything for a carrot, a fact we sometime use to our advantage! Nelson is the joker of the pack, always trying to get into mischief and mess around. He is still learning the ropes when it comes to therapy but he is brave and has lots of character, so he has started to tick the boxes. Nelson used to work on the beach at Skegness but he decided that was too much like hard work and started to lie down when his saddle was put on! He is only seven years old and we hope he will retain his sense of humour but start to focus a little more on the job!